Day 151: Do The Math – Is 30 is the new 15? Okay, so here we are on January 29th in the year 2013. So, all you trivia moguls – here’s your first trivia question . . . now remember, you’re going to have to put on your thinking caps for these questions – here comes number one: We were married on January 29, 1983, the very next day was the Super Bowl – who WON Super Bowl 17? Alright, so we go to question number two, in April of 1983, the University of Houston (Go Cougars) played for the NCAA National Basketball Championship . . . who won that game. (Hint: Brian turned the television off in total disgust after a Guy Lewis “5-minute stall offense). One of the fun parts about being newlyweds back in 1983 was finding a place to live. Brian had lived in an apartment for a while and Jean had been living at home, so the key was finding a place that would be perfect for both! We ended up in a two bedroom apartment off of Hollister and Tidwell. It was a relatively new property off of Hwy. 290 and it was close to both Jean’s and Brian’s work, so home it became. Probably one of the most memorable moments in their first year together was August 18, 1983 when Hurricane Alicia came calling from Galveston right up along Interstate 45. With the eye eventually passing right over the apartment complex, we took a short drive in the middle of the ‘fun’ followed by more fury from the opposite direction – a lesson in single pane glass – NOT a good idea for a hurricane – but we survived. Our wedding cake did not (tradition was to keep the top layer to be eaten for one’s first anniversay – with power outage – cake thawed and served as sister Sara’s birthday cake instead). Wow – several ‘classics’ among this list – several of which are still playing today on Turner Classic Movies and American Movie Classics. Funny, back then they didn’t seem like classics! Which is the PERFECT lead-in for tonight’s wine of choice. We felt that it was very important to enjoy a special bottle of wine in honor of our 30th Wedding Anniversary, SO we decided to GO BIG. Yep, after attending a tasting of wines from Krupp Brothers back when Grape Juice was in Ingram, we tasted some AMAZING wines from this winery in Napa. 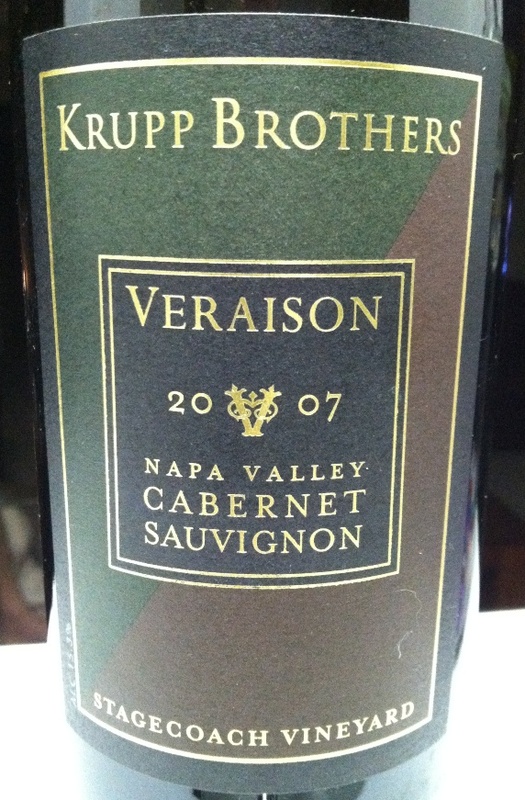 But the best of the best was the Veraison – and tonight’s wine is a 2007 Veraison Cabernet Sauvignon. Three letters sum this wine up: O M G!!! First of all, we have to tell you that this is WAY out of our normal price range. Thanks to the amazing 75th Anniversary Sale at Twin Liquors back in August of last year, this little gem has been lying down in our wine fridge waiting for the right opportunity to become part of the party! Well, tonight was the perfect reason to open a stellar bottle of wine. Bottles like this are few and far between, and with ratings in the 91-95 point range, we knew that we were getting something special. This wine was powerful . . . from opening with the deep, dark purple encircling the cork to the nose that was overwhelming with fruit and oak–to the taste that was rich, structured, full-bodied and thick as the day is long. We absolutely loved this wine. It was every bit as good or better than when we tasted it back at the “old Grape Juice” in Ingram, Texas. Those of you who follow this blog know that we love our big, bold wines, and this one may be the Granddaddy of them ALL!! It’s not cheap – typically above $60 a bottle, but if you pay attention to sales, you can get for much less . . . BUT not very often! We know why this is an amazing wine. So much going on in the bottle. Add in food and it’s an overwhelming experience. We found it the PERFECT way to enjoy our 30th Wedding Anniversary. 1983, was for us, was a GREAT year. We look back over the past 30 years and smile at the blessings that have been given to us – two gorgeous, smart, loving daughters; opportunities to see places we’d only read about; seeing our extended family grow and mature and become awesome, right before our eyes – it’s a marvel of life that we stopped to enjoy and hope that you’ll stop to enjoy your marvels as well. We enjoy sharing our wine stories with you and hope that tonight, and every night–that you’ll enjoy your favorite wine responsibly and remember to recycle whenever possible. Hears to 30 years together and the promise of another 30 !!!!!!!!!!!!!!!!!!! Categories: Uncategorized | Tags: 1983 Houston Cougars, 1983 Washington Redskins, Best Buy, Flashdance, Grape Juice, Hurricane Alicia, Krupp Brothers, Return of the Jedi, Risky Business, Terms of Endearment, Twin Liquors, WarGames | Permalink.